In collaboration with LDV, by Zevs, Jason is producing all of the jewelry, belts and bags for Zev’s show at the castle Chateau de Vincennes this summer in France and wanted Durable Technologies to engrave some custom steel hand stamps using his client supplied material that looked like they were from the 16th Century. 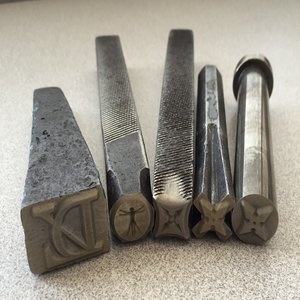 "Durable Technologies really cared about our design process and embraced the challenge of taking odd-shaped, old metals and turning them into some really amazing custom hand stamps. Most companies do not want to work with artists but they have a real "how can we help you?" attitude. Durable Technologies does a great job in a reasonable amount of time for a great price. They really understand low-volume production and custom engineering," says Mr. Ross. 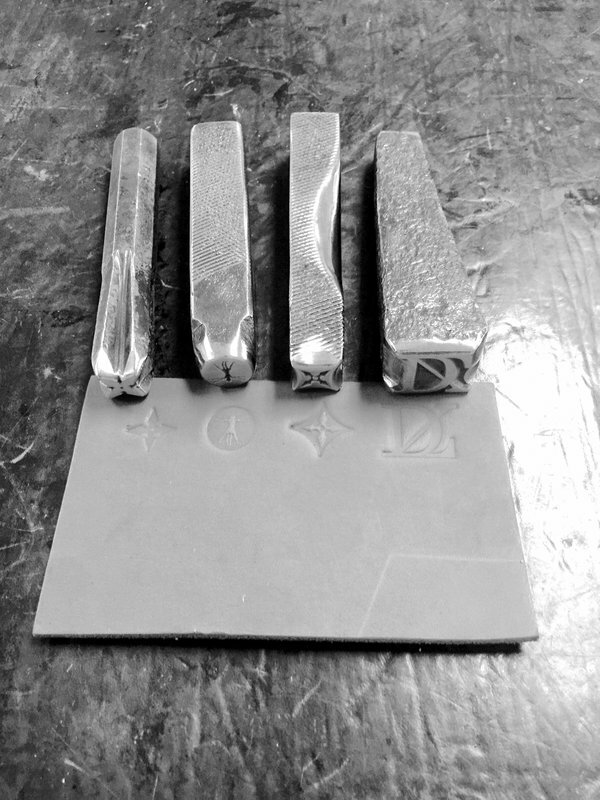 The photo below on the left shows the raw material used for the custom hand stamps. The finished stamps are on the right. Artemas Quibble also develops leather jewelry and accessories for Donna Karan International and Urban Zen. Here is a photo of leather marked with the custom hand stamps created by Durable Technologies. Durable Technologies has a custom steel hand stamp for your part marking requirements. We manufacture, according to your specifications, heavy-duty steel hand stamps that provide extra-long service life. Made from a special grade of tool steel, they resist spalling and mushrooming. Simple or complex text or logos and designs made-to-order. 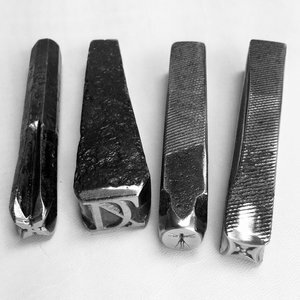 Sizes range from tiny steel hand stamps for marking jewelry to large steel hand stamps to mark steel slabs. Characters can be sharp face, low stress full character, low stress dot character, or customized to your specific marking requirements. Contact us to learn more about how we can help you with you part marking requirements. This post was published on July 12, 2016 and updated on July 12, 2016.